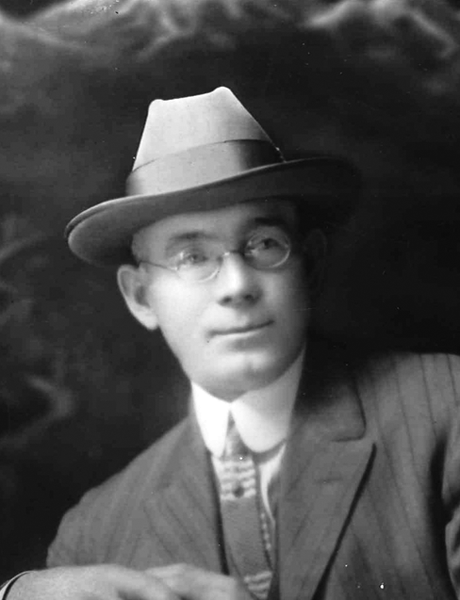 Born March 24, 1864, in Hamar, Norway, Hagbert “Bert” J. Enger came to America in 1877 along with his maternal grandparents (his mother stayed in Norway; his father is thought to have abandoned the family). The thirteen-year-old immigrant found work on a farm in Eau Claire, Wisconsin. Later jobs took him to Wisconsin sawmills, Dakota wheat fields, and the iron mines of northeastern Minnesota and Michigan’s Upper Peninsula. He later settled in Pine City, Minnesota, where he purchased half interest in a general store. According to Enger family historian Jim Insbell, the store “was a bad experience for several years due to old and shopworn merchandise. He eventually was able to pay off all debts, and he and his partner split the store, with Hagbert taking the hardware and furniture part of the business.” Enger then hired Emil Olson, a native of Minnesota’s Chippewa County, to work in the store while Enger made sales calls to farmers. Recognizing that the market was too small for the business to survive, Enger and Olson—now partners—decided to try their luck in Duluth. Insbell writes that the business prospered because “they were complementary to one another. [Enger] was cautious and conservative, and Olson was enthusiastic and impulsive. Enger was slow of speech, deliberate, and retiring. Olson was quick in speech and action, and enjoyed being in the public eye. In essence, the two men formed a perfect partnership, and they used an intermediary (a friend) very effectively when unable to agree on something. Both were extremely honest, intelligent and loyal.” Olson died in 1926. To the memory of Bert J. Enger, 1864–1931, Native of Norway, Citizen of Duluth. From Common Laborer to Merchant Prince, he demonstrated in his own life that America is a land of opportunity for the immigrant, and that her civilization is enriched by his citizenship. 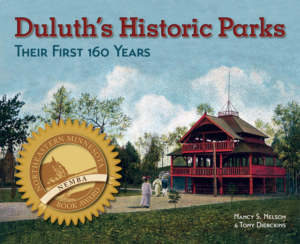 In his life time, by a very generous gift, he enabled the City of Duluth to acquire and develop the land adjacent to this tower as a park and golf course for the enjoyment of future generations, and at his death bequeathed two-thirds of his estate to the people of Duluth. Hereabout, in his life time, he spent leisure hours in admiration of the panorama of Duluth and its environs which you now may see from this tower. In recognition of his devotion and generosity, the people of Duluth elected him to their Hall of Fame and will always cherish his memory. Dedicated June 15, 1939, by Olav, Crown Prince of Norway.